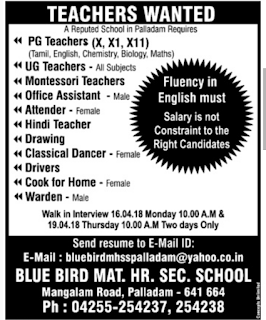 Blue Bird Matric Higher Secondary School, Palladam has advertised in THE DINAMALAR newspaper for recruitment of Teaching/ Non Teaching Faculty jobs vacancies. Interested and eligible job aspirants are requested to walk-in 16/04/18 & 19/04/18.Check out further more details below. 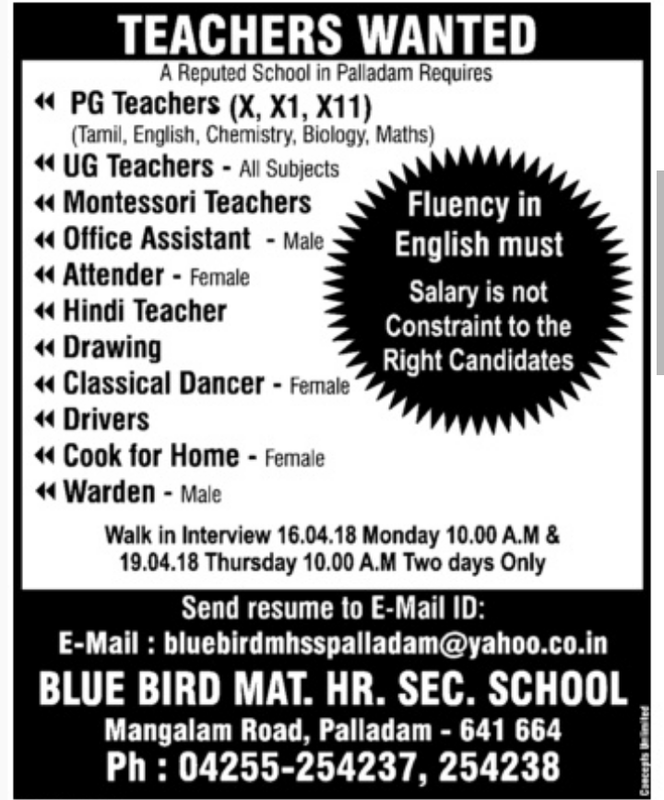 About School: Blue Bird Matriculation Higher Secondary School, Palladam, established in 1981, is a self-financing day school with a current enrolment of 1500. The school has made a significant contribution towards education excellence in the Palladam region. The school is a unit of SKR Educational Trust. The public charitable trust constituted with three trustees as given hereunder. Salary is not constraint to the right candidates. Interview Date: walk-in on 16th(Monday) 10 a.m& 19th (Thursday) April 2018 from 10 a.m,Two days only.